Saturday 28th February 11am till late: 5th BIRTHDAY CELEBRATION! Expect workshops, guest speakers, fun and games, pizzas, live music, tours, the cake competition, late night djs, and more. Help us start the next 5 years with a bang by joining in with preparation throughout January and February. We need help fixing, building and painting on site, cooking cakes and spreading the word. 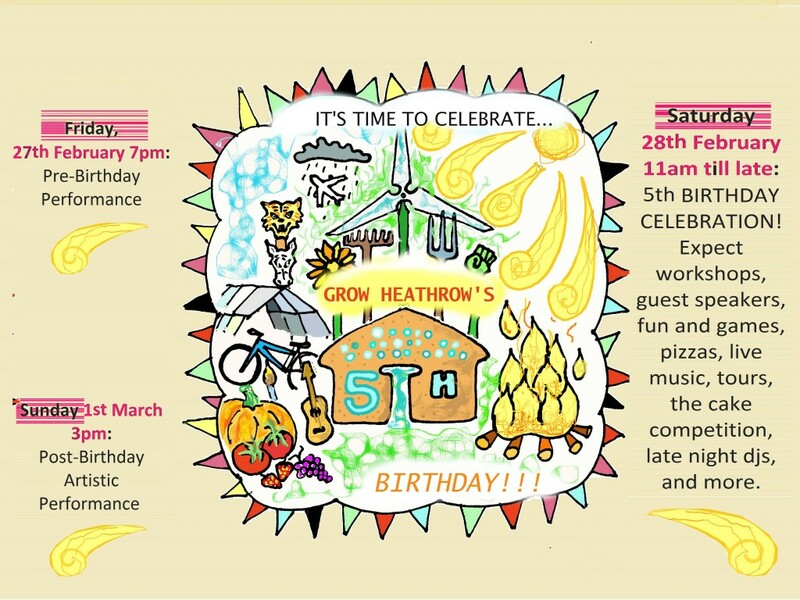 Come to the Grow Heathrow site and join in with tasks, especially on a Thursday as that’s our community work day. On the day, we’ll also need help cooking, entertaining the littluns, playing music and more. Plus, don’t forget to come along to one of the many workshops running at Grow Heathrow over the next few months as part of Shazam 2! What to bring Cakes, instruments, activities, stories. Warm clothes, a tent, sleeping bag and roll matt (we can provide some bedding and sleeping space under cover). Warm food will be provided throughout the weekend, but any extras are appreciated.